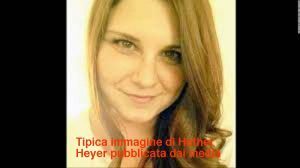 In a previous related article, (http://thesaker.is/the-two-americas-at-charlottesville/) I said there were still some unclear issues about the events at Charlottesville, especially regarding the death of the 32-year old Heather Heyer. On the other hand Charlottesville did as much political and social damage as it could be expected from the organized melee. Now noisy turbulence and popular clamors are abated. The novelty that captivates the superficial and the thoughtless is no longer, nor is the vehemence that delights the disturbed and the discontented. In the instance of Charlottesville, opinions not propagated by reason, but caught by contagion, have already been imprinted in the masses’ mind. No need for correction, when correction would unmask the imposture. 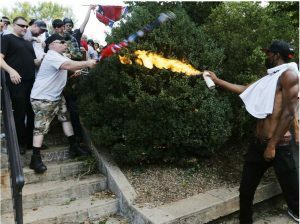 Given the current political-judicial atmosphere, it is plausible to assume that if the flame-throwing man had been a white demonstrator, he would now be in jail, accused of a hate-crime and attempted murder or similar. In jail, instead, is one of the authorized demonstrators who, to intimidate and deter the flame-thrower, shot a bullet to the ground with his revolver. The charge? Discharging a fire arm within 1000 feet from a school. For the “revolution” of Charlottesville – so similar to other “color revolutions”, but in a domestic version – also helps indirectly to increase the fake “public-opinion” pressure on Congress to grant the famous “amnesty” to illegal aliens – a measure of which the Zionists are the most active and vociferous promoters. For it was the Zionist senator Jarvis in 1965 who sponsored and pushed through the measure that “opened the gates” to unlimited immigration from third world countries. It is then clear to see the thread, the plot and the objectives. The Europeans are “suprematists” and “racists.” To oppose them it is necessary to increase the number of non-European immigrants, to fight the racist threat. By passing the “amnesty” measure, the time will be closer when the European ethnic component in the US will be a minority. Which is a stated objective of the plan by the Talmudist Coudeneuve-Kalergy in his book, “Praktischer Idealismus” – where he advocates a miscegenated universal negroid race, directed and managed by the best among the “chosen people.” For the “chosen people” are exempted and actually obliged not to mix with other races, a policy and practice openly applied in Israel and for all to see. But, as we know, reality is different. And the mass media, along with Zionist-inspired or funded think-tanks rely on this confusion to instill ethnic hatred against Americans of European origin. Even the sudden contempt for historical figures cannot be the fruit of popular inventiveness. In an environment where people at large cannot distinguish Austria from Australia (to quote Putin), history is even dimmer than geography, in the minds at large. Somebody must have come up with the idea of hating (what are considered) national heroes and of destroying their monuments. Past records of similar phenomena give us a clue as to the probable source – a well funded think-tank, via the variable weather of some academic mind, the flying vapors of incipient madness, which from time to time cloud reason, without completely eclipsing it. As another example, watch to your disgust the following masterpiece, by a rapper called “xxxtentacion.” The rap opens (from 0m10sec to 0m52sec), with a bunch of black students killing their white teacher Then (from 2m10sec to 3m33sec). a black man, with the help of a black boy hangs a white boy about 10-year old. The “success” of “xxxtentacion” and his ilk is not spontaneous. There is an “invisible hand” that creates all this. There is also one other extant and clear proof of a war against Europeans at large. Against the brave who dare to inform the people via alternative Internet channels, the Zionists are fighting a fierce battle. For it is important that the masses be unaware. To this end, the Zionists are doing what they can to block sources of alternative information. Given the total Zionist control of the information industry, they can shut down sites, as the Saker reported recently, and even hamper or impede the transfer of voluntary contributions to Internet sites and stations they dislike – in clear violation of the “First Amendment” of the Constitution on freedom of speech. To test myself that I am not imagining things, I find it instructive, at times, to consult sundry Israeli and/or Talmudic websites. I quote one here but there are similar others. In the video, the rabbi compares a Jew to a Goy, “even a good-natured Goy” – he says. This honorable interpreter of the “book of God” makes two comparisons. In the first example he refers to a bucket that an unnamed individual uses to collect water from a river or a well. 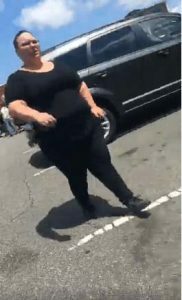 In the metaphor, the Jew is the water in the bucket, and the Goy the irrelevant drops spilled and lost while collecting and transporting the bucket. The second example is even more interesting. This time we are in a market where a Jew goes to buy a kilogram (2.2 pounds) of pickling cucumbers (about 10, apparently). The grocer uses an old-fashioned scale that cannot be very accurate. Rather than one accurate kilogram, the scale will measure a few grams more or a few grams less. Those few grams of cucumbers not included in the valuation of the purchase, correspond to the worth of a Goy, compared to the worth of a Jew, which corresponds to the actual kilogram. where an interested internaut can listen, laugh or cry at this and other similar sermons by such a creditable and instructive man of God. But it would be bitter laughter. For, as we know, these people tightly control all key aspects of politics, entertainment, finance and education, and maybe even sports. It was just announced that the next 2018 world-renowned 101st “Giro d’Italia,” the Cycling Tour of Italy, will start….. in Israel (! ), a racist, apartheid state, built on illegally occupied land. Which should tell us how far is the reach of the hand of Zion. It is an absolute first, the beginning of the Tour in a non-European country. On the other side of the pond, the same lugubrious characters, Kagan, Wolfowitz, Nuland (famous for telling Europeans to f—k off) and several others – those who gifted the world with the destruction of Libya, Syria, Iraq, the permanent war in Afghanistan, the “color revolutions” of Georgia and Ukraine, not to talk about 9/11, are still there, in the White House, in front or behind the curtains. The reader may meditate and perhaps set aside the “economic motives,” the “war for oil,” the “export of democracy,” and sundry other reasons peddled by the ruffian media to justify the wars, disasters and genocides of the last 20-30 years. I would invite him to read – in Dostoyevsky’s “Diary of a Writer,”- as a classical example “super partes,” above the fray, the chapter “The Jewish Question.” I mean Dostoyevsky, the miner of the deep in the human soul, the prophet of equality among people, the giant of XIX century literature and of humanity at large. Or he may read Solzhenitsyn on the same subject, in his two-volume book “Two Centuries Together.” Let the reader forget Charlottesville, or ignore all that was written and shown in this blog, and upon completing the suggested readings, let him reach his own conclusions.